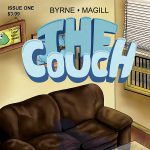 You are here: Home / Reviews / COMIX! What’s your family reunion like? An odd phenomena has been occurring in the comic book industry. Revenue generated by things related to comics, movies, merchandise, etc., has been steadily climbing for the last decade. But, and this is important, revenue from actual comic books have been in a steady decline. Both Warner Brothers and Disney have had internal discussions about spinning off DC & Marvel Comics respectively. Quite a large section of the internet has been devoted to what that might, might not, mean. 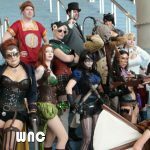 A subset of that has been devoted to what it will all mean to Diamond Distribution, the monopoly of comic book distribution. But a funny thing has been happening on the way to the death of all things. Indy comics have been popping up and filling some voids. Unencumbered by massive overhead and puritanical restrictions, they have been finding wider, and wider, audiences. I have written about a few of these before, and am about to do so again today, and have found a willing market. Those posts get shared, and re-shared, around the world. David Gabriel, VP of Sales for Marvel, famously said the reason for declining sales was diversity. This would be news to the creators who are out there now. From my humble offering, Legends Parallel, which is rated M for Mature and features a predominantly African-American cast, to Valiant Comics’ Faith Herbert series, about an overweight telekinetic girl, to the indy Geek Girl comic series, which has to be read to be believed, to more than I have time to mention, a whole slew of creators are setting the bar high with excellent story telling, beautiful art, and more diversity than you could shake a stick at. So let’s get this party started. There is so much fun, and angst, to unpack here it’s thrilling. Dr. Warren J. Lee, a very white man who keeps getting confused for Korean due to his name, is a shrink in somewhere U.S.A. He has issues that make him socially dysfunctional. Lots and lots of issues. He fires his secretary, who is also his girlfriend, via email. He deals with OCD patients in a way that borders on torture, and is up to his heiney in debt. He doesn’t even know how to bill a patient. To make his life even more chaotic I should note that he lives in a universe populated with super heroes. Naturally they do not make his life better. 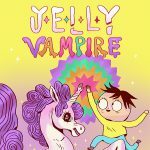 Jelly Vampire follows the adventures of a young girl named Lulu. That will be the only normal fact from here on out. When she plucks her eyebrows they turn into butterflies. When she puts hand cream on her feet, her feet turn into hands. She meets a magical being who can make her life wonderful and eats it. She meets fascists. She turns into a giant worm. She becomes a princess of a candy kingdom and ends up killing, and eating, everyone there. We won’t even talk about the unicorns. That is a whole series that will send you to Mr.Lee’s couch above. Each of the episodes of Jelly Vampire is short and free to read online. If you need a reference point just think of the Far Side on acid. I couldn’t stop smiling when I read the preview edition they sent me and I doubt that you, faithful reader, will be disappointed when you check it all out. In the mood to hearken back to the glorious days if yesteryear? Are the classic comic books of The Phantom, The Lone Ranger, and others, what’s missing from your life? If so, I have some great news for you. Brother Bones is cut from the same cloth as those classics but takes it in a whole new, and fun, direction. The hero is a former mobster turned monk, thus the “Brother” moniker, who gets whacked at a monastery and, in death, is given the chance to save his soul. So far so good. But, to make it all work he has to take over the body of his mobster brother. Oh, did I mention his mentor in death is a young woman he killed? I really should. Brother Bones is non-stop action writ large in stark, black and white, images. It’s a great read for all ages and it’s a fun series to follow. 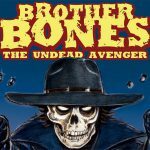 Check out all the issues of Brother Bones if you want to make your day better. So, there you go, three wildly different comics to enhance your cool factor. Trust me, bust these out on the bus and you’ll be hipper than the cool kids and a a lot more fun to talk to. Listen to Bill McCormick on WBIG (FOX! Sports) every Friday around 9:10 AM. Stay up to date with his podcasts here and here. Your Ad Can Be Here Now!